A new paper published in Palaeogeography, Palaeoclimatology, Palaeoecology reconstructs temperatures in Patagonia, Chile over the past 1,600 years and finds temperatures were warmer during the Medieval Warming Period in comparison to the 20th century. The authors find "warmer temperatures [than 20th century mean] from AD 600 to AD 1150 and colder temperatures from AD 1200 to AD 1450." 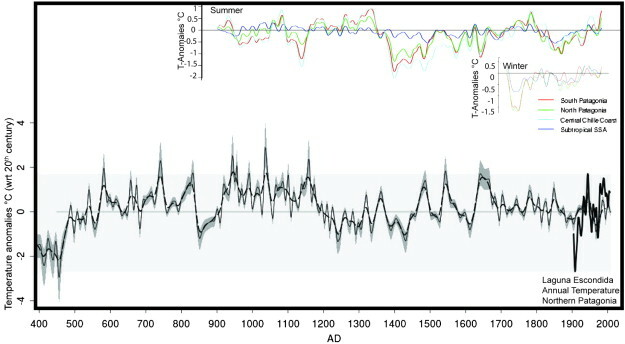 The paper also notes climate was much more variable and extreme in the past, stating, "From AD 1450 to AD 1700 our reconstruction shows a period with stronger variability and on average higher values than the 20th century mean." The paper adds to the published work of over 1,000 scientists demonstrating that the MWP was as warm or warmer than the present, and also shows climate was more variable and extreme prior to the 20th century. Climate and environmental reconstructions from natural archives are important for the interpretation of current climatic change. Few quantitative high-resolution reconstructions exist for South America which is the only land mass extending from the tropics to the southern high latitudes at 56°S. We analyzed sediment cores from two adjacent lakes in Northern Chilean Patagonia, Lago Castor (45°36′S, 71°47′W) and Laguna Escondida (45°31′S, 71°49′W). Radiometric dating (210Pb, 137Cs, 14C-AMS) suggests that the cores reach back to c. 900 BC (Laguna Escondida) and c. 1900 BC (Lago Castor). Both lakes show similarities and reproducibility in sedimentation rate changes and tephra layer deposition. We found eight macroscopic tephras (0.2–5.5 cm thick) dated at 1950 BC, 1700 BC, at 300 BC, 50 BC, 90 AD, 160 AD, 400 AD and at 900 AD. These can be used as regional time-synchronous stratigraphic markers. The two thickest tephras represent known well-dated explosive eruptions of Hudson volcano around 1950 and 300 BC. Biogenic silica flux revealed in both lakes a climate signal and correlation with annual temperature reanalysis data (calibration 1900–2006 AD; Lago Castor r = 0.37; Laguna Escondida r = 0.42, seven years filtered data). We used a linear inverse regression plus scaling model for calibration and leave-one-out cross-validation (RMSEv = 0.56 °C) to reconstruct sub decadal-scale temperature variability for Laguna Escondida back to AD 400. The lower part of the core from Laguna Escondida prior to AD 400 and the core of Lago Castor are strongly influenced by primary and secondary tephras and, therefore, not used for the temperature reconstruction. The temperature reconstruction from Laguna Escondida shows cold conditions in the 5th century (relative to the 20th century mean), warmer temperatures from AD 600 to AD 1150 and colder temperatures from AD 1200 to AD 1450. From AD 1450 to AD 1700 our reconstruction shows a period with stronger variability and on average higher values than the 20th century mean. Until AD 1900 the temperature values decrease but stay slightly above the 20th century mean. Most of the centennial-scale features are reproduced in the few other natural climate archives in the region. The early onset of cool conditions from c. AD 1200 onward seems to be confirmed for this region. ► We analyzed sediment cores from two adjacent lakes in Northern Chilean Patagonia. ► Within the last 3600 years we dated eight tephra layers. ► Biogenic silica flux is correlated to air temperature from AD 1900 to AD 2006. ► A temperature reconstruction is developed for Laguna Escondida back to AD 400.